Luton Town have confirmed that they have received an apology from the FA over the red card shown to Ryan Hall last week, but the winger will still miss Sunday’s trip to Dagenham & Redbridge. A statement on the club website said: “The club have sought clarification from the match referee and the Football Association regarding the circumstances leading to Ryan Hall’s red card in our game with Plymouth Argyle last weekend. “Hall, the coaching staff and many spectators were bemused when Hall was shown a red card in the 82nd minute of the match because, although Ryan was involved in an incident a couple of minutes earlier when a yellow card was shown by match referee Ross Joyce, it did not appear that it was Ryan who was being cautioned. “To many it in fact it looked as though it was a Plymouth player who was cautioned, presumably for something he said to the referee. Therefore, when Ryan committed another foul shortly after and kicked the ball away – an action the midfielder regrets and admits was done in the spur of the moment – he was expecting just a yellow card – and not a second yellow and subsequent red card. Ryan was genuinely stunned. “As a result, the club contacted the FA who subsequently contacted the match official and have received an apology for the lack of clarity – for both players and spectators – as the two incidents unfolded. “The FA accepted that Mr Joyce did not make it clear who was being cautioned in the first incident. The FA confirmed that no appeal against the red card is possible under FA disciplinary procedures. 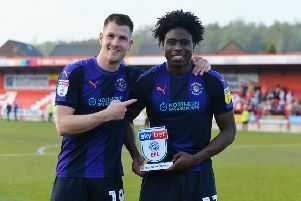 “Luton Town remain hugely disappointed with the events of last Saturday, believing that Ryan would not have kicked the ball away if he had known he had already been cautioned.